In this post you will learn about the basics of social media for filmmakers in 7 actionable tips. How a filmmaker can use social media to find work and how a filmmaker can promote themselves. I am using both my own experience and I will also link to the best sites online that have researched into this topic. Facebook groups are quickly becoming a great way to network and find local film jobs. Once again use Facebook's search bar as you would Google and this time search specifically for groups. Some Local groups do advertise paid film work. Some companies also advertise jobs on their own Facebook pages. By searching through Facebook I have found Gems Agency and TV Runners . Good keywords to use – your job title, your city, film work, film jobs. Have a search for yourself see what groups are active near you. Make it easy for people to hire you via any social media. You may be hired after a person has followed you for years on social media or from a quick search. Every profile you create on any social media should say your job title and where you are based. If you are looking for Camera Assistant jobs - your job title should be Camera Assistant. This is because profile descriptions are searchable via Goggle, it also makes it easy for people to understand what you do and how to hire you. Every social media profile should also have a link to your website, show reel or email address. You could also create a link that clicks directly to your CV. The aim is to not let people forget about you and your work. A few years ago I used to regularly work on film sets and I still stay in touch with crew I worked with via social media. Consider this when you are working on your next film set follow members of the cast and crew via social media. This is an easy, acceptable and non-intrusive way of keeping in touch with new contacts. Especially as a freelancer when you are meeting new people all the time, don’t lose the contacts that you make project to project. Some people also have had luck with LinkedIn it may be worth setting up a profile to see if it works for you. It is very likely that the great filmmakers of the future will have had some influence online. More than ever it is necessary to build your own audience before financiers will take an interest in you. Begin by choosing just one social media platform to promote your work and network. This could be through any of the social media sites through using Words, Images, Audio or Video. Take your time to create relationships with other filmmakers online. This is something I have come to realise - the other filmmakers online are not your competitors but your allies. Film is very competitive, there are a lot of us out there trying to attract attention for our work every day. You are not going to get noticed unless you have a strong online network. To do this promote other people's work on your own social media, reply to every message you receive and follow others in the same way you wish to be followed. You do need to be consistent when it comes to social media. 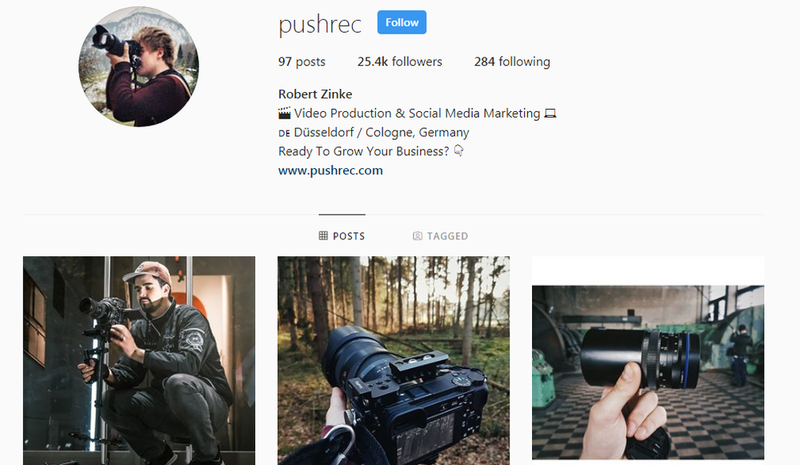 An Instagram profile does not grow if you upload less than once a week. A Twitter feed will not be followed without regular updates. You don't need to post on social media every day but you do need to keep your profile looking active. To make things easy most social media platforms allow you to schedule posts in advance (I use Buffer for Twitter posts). Although it is good practice to post in present time - technically you could schedule all of your social media posts for the week in just one afternoon.